Today’s Monday’s Many Thanksgivings brings me to a subject that was a surprise to me in this journey: The gift of open adoption. If you would have asked me about things I would be thankful for when we started this journey, this would have not even made the list. Prior to working with Turkey-Man’s birthmother Mama-A, I could not have ever imagined that adoption could look like it does today in our life. Before our relationship developed, the thought of an ongoing relationship felt a bit threatening to me. I wanted to be the only mom in my children’s lives. I was afraid that I would feel a sense of competition with their birthmother, insecure that they would continue to feel more attached to her than to me. I think I also feared that boundaries would be blurred, like the kids would be confused as to who their mother actually was. Very thankfully, I was wrong. Little-Flower is still too young to even understand the role of her birthmom, Mama-D. But, Turkey-Man is starting to understand that something is a little different for him. A few weeks ago he turned to me and randomly said, “Mama-A is my mama.” It was out of the blue said with the same emotion one might use observing it’s a sunny day today -very matter of fact and then he was off playing, leaving me wondering if I handled it correctly. I just explained to him that he was right, he has two mamas. Open adoption is not easy. I have seen it compared to marriage where it takes effort on both ends to make it work. I get anxious every time we get together with one of the birthmothers. I want the bond to be strong. I want the kids to respond well to her presence. Obviously, I have no control over their responses, but I fret nonetheless. Sometimes it makes me self-conscious about my mothering style. After all, these women entrusted their baby to me to raise. I want it to be evident how much I love the child they have blessed me with. Probably the worst part of it for me is watching them say goodbye. The last time I watched Mama-A say goodbye to Turkey-Man, I almost cried. I am living a life where I cannot imagine having to repeatedly say goodbye to my child, not knowing when I will see them again. The guilt of mothering another woman’s child rears back up in moments like that. But, then I know the gift we all have in having the relationship in place. The kids will have an immediate source to direct their adoption related questions to. I won’t have to speculate answers based off of how I think their birthmoms felt. I hope it will help them in forming their identitiy. I have read that one of the issues with adoption is that it leaves the kids feeling like they have no roots. They don’t understand where they came from. With open adoption, it gives my children access to their roots. I have been surprised over the years how much of my early concerns with open adoption have dissipated. Turkey-Man has a strong attachment to me. His relationship with Mama-A is an entirely different relationship than he has with me. I treasure that he has unique relationships with both of us. I look forward to watching the bond between Little-Flower and Mama-D form as she gets older and starts to understand the special role Mama-D has in her life. It’s not threatening at all to have these relationships in my children’s life. Instead of threatening, it is rather beautiful. Both of my children have more people that unconditionally love them than most other children are ever blessed with. And, that’s something that a child can ever have too much of! One of my biggest fears about open adoption is the “openness.” But we are going that route because everything we read says its best for the child – thank you for sharing this and providing me with an understanding of your initial fears and the reality of it all. No problem! If you have further questions as you go you can always shoot me an e-mail. It certainly takes navigation, but long-term I think it’s what is best for our kids. We are fortunate with the birthmothers that we have. They are good at respecting boundaries which makes it easier to keep therelationship going. Not every adoption is best to keep open. You have to go into ot with wide open eyes and make sure it’s right for everyone involved! Thanks, I think you make a good point that “not every adoption is best to keep open.” From our understanding, as the adoptive parents this will be fully in our control and should we ever need to remove contact it is our right. Thank you so much for sharing this! We are just starting down this road and I really like your insight and will take it to heart. 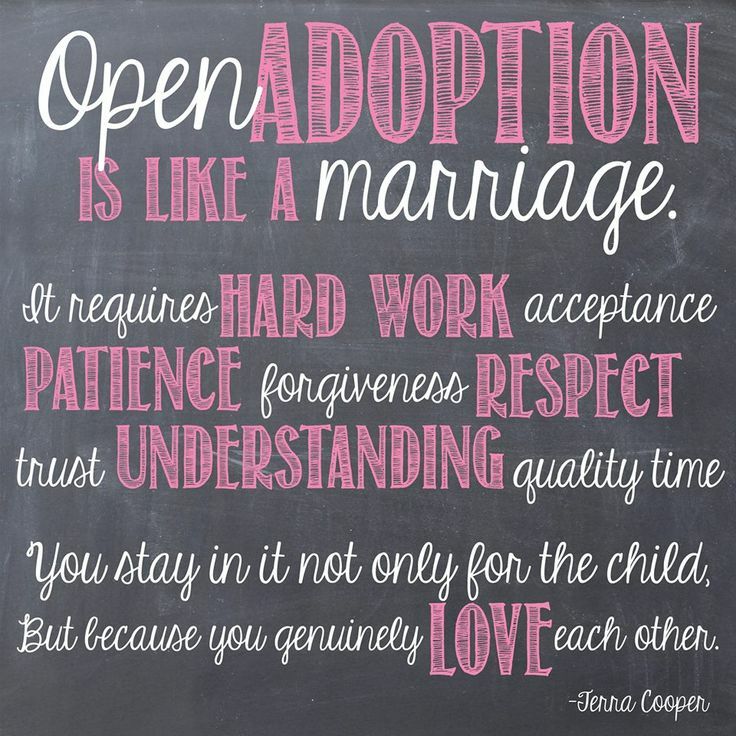 I have read several things that talk about the importance of an open adoption and I am really praying about it. It is not for every situation. We are fortunate it works for us. Both kids’ birthmothers were just young. They have great hearts and we have a mutual respectful relationship with both. Keep an open mind, but with eyes wide open as well and make sure it is something that will benefit all three sides of the adoption triad. Glad you found this helpful!